Born in 1976, King County Medic One is one of the largest providers of Advanced Life Support and Paramedic transport services in King County. As a third-service EMS agency, all funding comes from public sources, in our case by Proposition One, the King County Medic One/EMS Levy, which is voted on by the citizens of King County every 6 years. 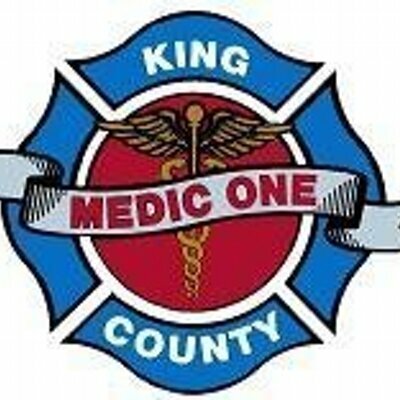 As the sole Paramedic provider covering the communities of North Highline, Burien, Tukwila, SeaTac, Des Moines, Federal Way, Auburn, Enumclaw, Kent, Covington, Maple Valley, Black Diamond, Renton, Skyway and all unincorporated parts of the county in that area KCM1 provides services to approximately 750,000 people and an area more than a third the size of the entire county. The department is currently staffed by 73 paramedics who operate the 8 Paramedic Units in southern King County, as well as fill several administrative and supervisory positions. We also have six non-Paramedic personnel who provide support to our daily operations. Our medical program director, Dr. Peter Kudenchuk, is an interventional cardiologist with the University of Washington. Before providing care to the public, all of our paramedics are required to attend the University of Washington’s Paramedic Training Program, based out of Harborview Medical Center. This program is 10 months in duration and students complete over 2,500 hours of intensive clinical and field training. After successful completion, every KCM1 paramedic completes a full year of probationary evaluations, including on-going training, supervision by a field training officer, and medical review by the medical program director as they learn to best provide medical care to the public. Prior to employment with KCM1, all potential employees are required to have at least three years of service as an EMT or Paramedic; at present, new employees have an average of over six of years of EMS experience. In fact, almost half of all KCM1 Paramedics also have previous experience as Paramedics in other EMS agencies, and a number are experienced nurses as well. As a targeted-ALS agency, KCM1 responds to over 16,000 critical emergency calls every year. Our paramedics bring a wealth of knowledge and experience to every call, with the current average number of years of experience with KCM1 being over 15. In fact, though our newest employees have only just begun their training, it should be noted that we have 20 Paramedics with over 20 years of experience, with our longest serving having reached the 39 year mark. With all this experience, KCM1 has been able to branch out and provide services beyond 911 medical emergencies. We provide medical standby for all SWAT activations in southern King County. We have recently taken the lead in training local fire, police, and EMS personnel in how to safely provide medical care in the case of an active shooter incident. To prepare our local schools in case of a shooting, we have taught over one thousand teachers and staff Basic Trauma Care For Educators. As a result of our partnership with King County Sherriff’s Air Support Unit, 17 paramedics have gone through advanced training to respond to wilderness emergencies throughout the Pacific Northwest to provide helicopter rescues. We have taken the lead in a regional Fire and EMS plan that entails identification, treatment, and transport of patients suspected of having Ebola or other infectious diseases. During last year’s tragic and unprecedented outbreak of wildfires in central Washington, KCM1 sent paramedics to provide medical support at the Okanogan Complex. Over the last 39 years, King County Medic One has grown from two units to our current staffing of eight Paramedic Units in SeaTac, Renton, Auburn, Kent, Federal Way, Covington, Enumclaw and Des Moines. We look forward to continuing to serve you in the future!